Former Defense Minister confirms he is in talks to join Benny Gantz's new party, says politics behind timing of Hezbollah tunnel operation. 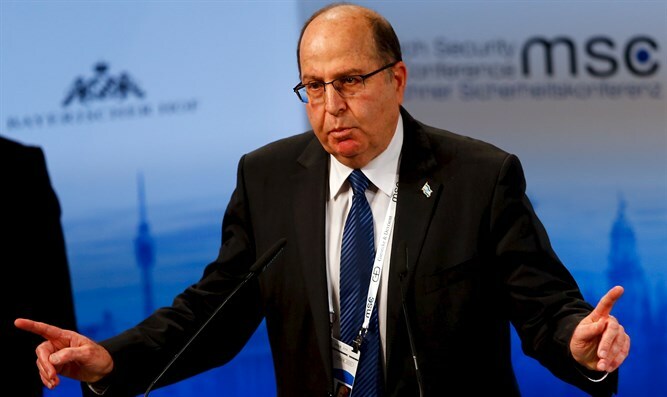 Former Defense Minister Moshe 'Bogie' Ya'alon accused Netanyahu of hyping up the IDF's current operation against Hezbollah's tunnels in northern Israel and vowed never to join a government ruled by the premier. Speaking at a cultural event in Haifa on Saturday, Ya'alon said that "politics penetrated everywhere, including cabinet discussions" during his time as defense minister. Ya'alon also accused Netanyahu of deciding to embark on the current option to destroy tunnels built by the Hezbollah terror militia out of political considerations. During the event, Ya'alon confirmed that he is in talks with fellow ex-IDF Chief of Staff Benny Gantz to run together ahead of the upcoming elections in April but vowed never to join a government led by Netanyahu. “I won’t join a coalition headed by Benjamin Netanyahu, said Ya'alon. "We’ve been talking since before the elections in order to reach a shared agenda. What is being reported at the moment is just the beginning." Ya'alon served as Defense Minister from 2013 until he was replaced by Yisrael Beytenu leader Avigdor Liberman in 2016. His relationship with Netanyahu has deteriorated since he was forced to leave his ministerial position. Reports last week said that advanced contacts have been taking place over an alliance of former chiefs of staff Benny Gantz and Moshe Ya'alon, with Gantz heading the party for the 21st Knesset. According to Hadashot 2, the list of the chiefs of staff will seek to provide a response to security concerns, with Ya'alon's inclusion aimed at avoiding a left-wing image for the party.